Testimonials - Welcome to Foxview Stables! "WOW! I realized JUST how powerful body language and energy can be! I will be more thoughtful in the future as to how, when, where, why and on whom I am using these tools." 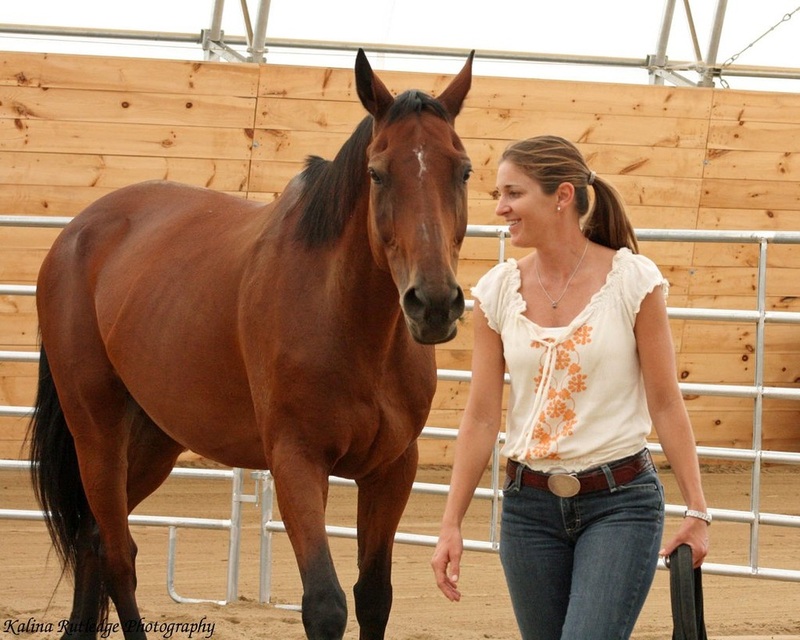 It's hard to believe that it is only one short week since I attended "Learning From the Inside Out" with Koelle Simpson at Foxview Stables (August 2011). Earlier in the year I went to Arizona to work with Koelle Simpson and Martha Beck in a similar workshop. It was a powerful "change my life" experience. These expert Equus/Life Coaches provided revealing insight into what I was and wasn't clearly expressing to the horses and what it was the horses were mirroring back to me. I saw myself and my life through new eyes. I began my workshop this time with the intention to be guided by the horses to gain insight into how to become a better listener and how to be less aggressive and less defensive in my approach and reactions in life. I sought to become more empathetic and responsive. This line of insight and inquiry had started for me in Arizona. I jumped at the chance to continue to learn from the horses in this unique way here in Ontario. I want to emphasize that the facilities in Arizona were 1st class/world class. To my amazement it was the site for the television filming of the "Finding Sarah" (on OWN TV Network) segment where Sarah Ferguson works with Koelle Simpson and Martha Beck to gain insight into herself through Equus coaching. To my utter delight Foxview Stables was on par in every way with my Arizona experience! 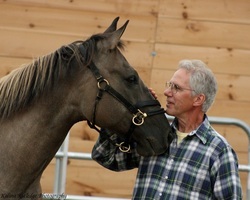 From the beauty and comfort of the indoor arena, to the quantity and quality of horses, the professionalism of the staff, the quality of the snacks and lunches and the general serenity of the surroundings Foxview Stables offered a 1st class environment for this unique personal growth opportunity of Equus coaching. Already I see, hear and feel evidence that "Learning From the Inside Out" has positively impacted my life, my work and my relationships. I am putting into practice my own insights, the horses' mirroring, the life coach feedback, and the shared experiences of the other workshop participants to imprint within myself all of these powerful lessons. Marlene, I thank you from the bottom of my heart for bringing this workshop to Ontario. I thank you for manifesting your own vision which is Foxview Stables. I look forward to returning to your beautiful facility. I will spread the word. It was great to have your e-mail, and I must thank-you for your kindness and for opening up your home to us . It was great to study under Koelle as she is a great teacher. Just the fact that she does not judge you and works from the place of the heart is very rare for anyone. Also the fact that she works with energy was great for me as I work with energy in my healings. I also learned a lot from just watching others work with the horses to see where there were issues in me that were the same. It was not by mistake that we were there working togehter we are all connected. The horses are great to work with as they have so much to teach us humans on how we could get along with each other. I came away from this week-end feeling more empowered and thankful. So thank you and your family and the horses for a great week-end. 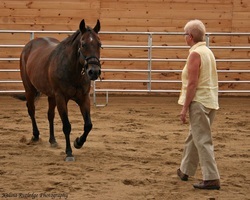 I've just returned from a two day workshop near Ottawa that integrated horse centered activities. 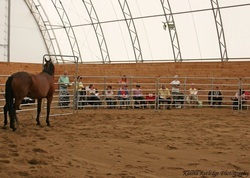 This was held at Foxview Stables, owned and operated by Marlene Armstrong. I loved the peaceful and well kept 15 acre grounds. The large indoor arena was clean and open. What impressed me most though was the effectiveness and professionalism of the staff-all of the various activities (a constant supply of fresh horses, support and accommodation for breaks and lunch, support for attendants) were provided with seamless ease and proficiency. I would encourage anyone considering facilities of this kind to look into Foxview Stables. "The horses taught me two big lessons in leadership; to remain calm and to be clear about where I am going. These are insights that have stayed with me." Catherine Aubin, Conflict Management Practitioner.